Yellowstone National Park re-opens May 10th! Celebrate with family and friends in the beautiful Tetons. Great 5 bedroom with a private hot tub at the ski resort in the woods. Enjoy the pool table, foosball and the Teton Sports Club membership for no additional charge in summer. We just updated the great room floors with beautiful hickory and 5 "smart" TV's in the great room and bedrooms! We are located in Teton Village, just two blocks from the tram and gondola of Jackson Hole Mountain Resort; near the southern entrance to Grand Teton National Park. Teton Village is a vibrant hub of activities and restaurants all summer and winter. The busy town of Jackson is only 12 miles away for more shopping and eating options. New this season: 5 "smart" flat panel TV's, including a 50 inch model in the great room with 42" speaker bar, blue tooth enabled to play your music ! Please don't miss the section 'guest comments from owner' (between owner info and photo section below) to read from the 150 entries our guests have hand-written in the Mountain Haus guest books since 1997! In winter, ski to the house for lunch or at the end of your day, from the base of Union Pass chairlift right to our outdoor spa privately tucked in the trees! Visit Jackson Hole and the surrounding National Parks before and after the crowds! May, September and October are the best months to view wildlife! In summer, come experience the new common area with kids' fountains, bungie trampoline, climbing wall, mountain biking, bike paths, hiking, Aerial Tram and lots more. Now, Teton Sports Club in the Aspens (4 miles away) is included for our guests at no additional charge June through August. The facility includes a swimming pool, spas, tennis courts and a gym with climbing wall. In Winter the main gondola and new tram are approximately 3 blocks away, a short walk or shuttle bus ride. The auxiliary Moose Creek lift is even closer. Ski downhill from the Union Pass Lift, along Morley Drive and into Mountain Haus' backyard for lunch or at the end of the day. Many ski season guests like the freedom of a rental car to visit other attractions in the valley, but others rely on the Teton Village Shuttle Bus(which runs until 10 pm) and the Jackson START Bus which accesses the Town of Jackson with its additional shopping, restaurants and bars. You are renting DIRECTLY FROM THE OWNER who lives in Jackson Hole year round, not an agent or representative. 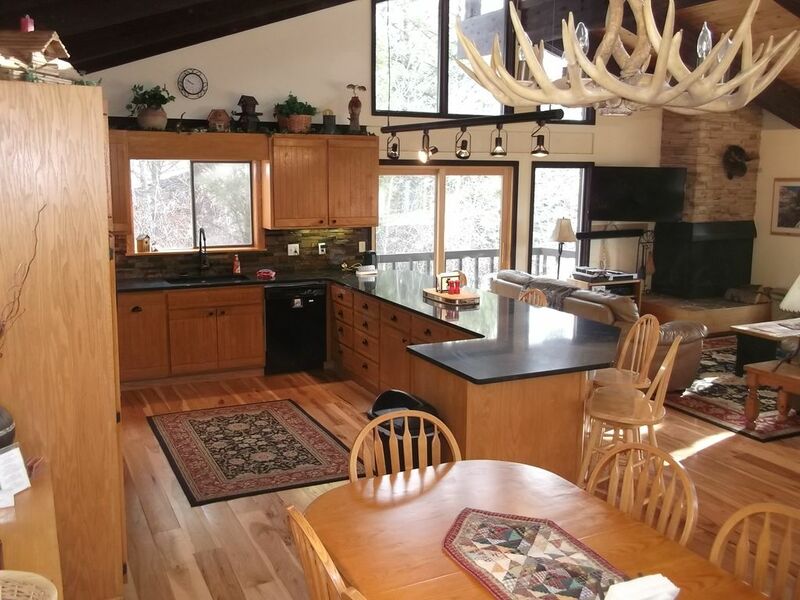 Owner has 17 years of experience with this property in Jackson Hole. Mountain Haus lies on a quiet, beautiful, wildlife friendly treed lot in the original residential section of the Village with plenty of privacy, almost 1 acre, yet all of the amenities of being in a ski village. Relax on one of the balconies or in the outdoor private hot tub to enjoy the plentiful wildlife surrounding the house year round. This home sleeps up to 17 people in three king-size beds, three queen-size beds, one full-size, two extra long twins and one additional twin. Your vacation will be made as convenient as possible with the inclusion of many extras such as a pool table, foosball table, games, toys, X-box, poker chips for hours of entertainment. Wireless Internet and Cable TV/VCR/DVD in every bedroom; smart TV's in 4 bedrooms and the Great Room! The front door is level with the large driveway. There is plenty of parking for your group. The yard is left natural to accommodate the wildlife. The five bedrooms of 'The Mountain Haus' are named after the famous mountain peaks that surround the 1800's fur trapper Davey Jackson's 'Hole'. The large entry hallway has a graceful staircase to the Great Room and large 'Grand Teton' master bedroom and bath with king bed, fireplace and soaking tub. The remaining four bedrooms are back down the staircase on the entry level. The 'Rendezvous' and 'Moran' bedrooms are on the left, each has king bed and private bath. The family wing on the right has two additional bedrooms, a shared double sink bath with private access from both bedrooms: The 'Apres Vous' bedroom has a queen over queen bunk bed and separate extra-long twin bed; the larger 'Sleeping Indian' bedroom has two bunk beds: twin over a full sized bed and extra-long twin over a queen bed. The private hot tub is level with the entry, just a few feet from the front door but set privately amongst the trees. There is an extensive local library available to guests with Grand Teton and Yellowstone National Parks information and guidebooks to borrow for your stay. A seasonal Jackson Hole Tourist Information packet can be mailed to every guest to enhance the planning of your special vacation. The kitchen is extremely well stocked and even the most discerning cooks enjoy having most things at their fingertips. No need to buy all the extras like most rental homes: detergents, napkins, foil, paper products, trash bags and more! All linens are supplied and housekeeping upon departure is also included for no additional fee. The house is designed for your family and friends to just come, enjoy and relax! Our previous guests are our best advertisement: Please read through the guestbook comments on this website! I am a retired, California native, UCLA trained dentist who finally found what I believe is the most beautiful place in the world to live. My passions of the outdoors through skiing, hiking, horseback riding, boating, fishing, and photography whether it is summer and 80 degrees or winter and 20 degrees, there is never a bad day in Jackson Hole. My assistant and I have owned and personally manage the property from our ranch just 5 miles away since 1997. Jackson Hole Ski Area is one of the best ski areas in the US. Although I have skied all over the world, I have never been an expert or extreme skier. The variety and expanse of terrain here means that one never gets bored! My boys learned to ski on the Teewinot and Apres Vous side of the resort, and now enjoy skiing and boarding the entire mountain. The resort is large enough to separate the beginner/intermediate areas at the north end from the challenging cliffs, chutes and un-groomed powder runs that Jackson is famous for. I was living in the Bay Area for many years ago and visiting my cabin in Tahoe for my mountain experience, but ultimately moved to Jackson Hole. There are actually more visitors to this area in Summer than in Winter. There are several reasons for that: #1 We have two national parks within an hour's drive. Grand Teton National Park, adjacent to and just north of Teton Village, and Yellowstone National Park, about 60 miles north. All of the countryside in-between is 'open space', with only a few in-holdings and human comforts. The two parks are incredibly disimmiliar in character. Grand Teton has it's towering spine of mountain peaks, glaciers and lakes below; Yellowstone is a high plateau situated so close to the earth's magma that it has the highest concentration of natural thermal features in the world: geysers, boiling mud pots, bright-colored thermal pools, steam vents....but both parks have an important feature in common...wildlife. I have to admit this is a weakness. Tahoe has a wonderful black bear and deer population that I always enjoyed, but in the Greater Yellowstone Region, of which Jackson Hole(which defines a long valley with several small towns including the Town of Jackson and Teton Village)our wildlife including elk, bears, moose, bison and wolves flourish. Mountain Haus is fully stocked with everything a group needs for a stress-free vacation. In my many travels, I always appreciated the little things to make my vacation more enjoyable. Here you do not need to bring toys, movies, books - both novels and local interest. We even supply a pair of binoculars if you forget your own! No running to the store to buy more detergents because all that was supplied was a 4oz sample! We pride ourselves on being different than the average vacation home and have over 17 years experience. Every guest receives by mail the seasonal tourist magazine and Teton Village map with the house clearly marked. Keys are left at the front door in an envelope clearly marked for the guest...no need to make an extra stop to check in. Eight foot tub with lots of jets. Located 20 feet from the downstairs entrance (and level with it) and Rendezvous bedroom. 2 Fireplaces(living area and master), Pool table and Foosball table in Great Room, Xbox and Games, High Speed Wireless Internet, 6 Cable TV's, 6 VCR's, 6 DVD Players, CD Stereo with IPOD adapter in Great Room, Video games, Toys, Board games and Poker chips, Video/DVD library, Jackson Hole, Grand Teton and Yellowstone National Park Information Library, history, touring; Fully equipped Kitchen, Gaggia Espresso, Cuisinart, 4 Hair dryers, High Chair and Portable Crib, Firewood provided, Washer & Dryer (with Detergent), , Private Outdoor Hot Tub in the Woods, Pet OK with approval-awesome hiking and quiet street, Sleds and Snowshoes in Winter, Binoculars for wildlife viewing, Owner of 17 years lives in Jackson Hole. You are renting directly from the owner. Swim Club/Tennis/Gym at no extra charge June through August. Rafting (Float or White-Water), boating, kayaking, Miniature Golf and Alpine Slide, winter tubing, Refuge Sleigh rides, Wildlife Tours museums and shopping, 90+ restaurants in and around Jackson Hole. Grand Teton NP souther entrance 2 or so miles north. Yellowstone 60 miles north. Teton Village has Frisbee Golf, Climbing Wall, Bungie Trampoline,fountains, concerts, wildlife programs, mountain biking, Gondola rides, hiking, tandem Paragliding; skiing, dog sled tours, sleigh rides, X-country skiing, entertainment, restaurants and three small markets/liquor within walking distance.Other activities include golf, Indoor Swimming with Slide, Hot Springs, Chuckwagon Dinner Shows, Rodeo, Elk Refuge a Sleigh Rides, Dog Sled Tours, Alpine Slide, Winter Tubing, museums, shops and 90+ restaurants in and around Jackson.